Did you know your WATER could be too acidic for your body? Yes, that is indeed a fact when you are using regular public water. For almost all of us in the western world, our water is treated with chlorine and fluoride, two of the biggest chemicals to disinfect and "fortify" our teeth. I think it's safe to say that we need to measure the pH levels of the water, to ensure we are being exposed to non-corrosive levels of acidity. This proves especially TRUE if you are suffering from any kind of skin irritation after taking a shower. In addition to THAT, by using a pH meter, you can measure the acidity and alkalinity of almost any other liquid to ensure the levels are at appropriate levels. In this complete guide, you'll see a list of the 8 best ph meters. I'll give a brief overview of the top 5 picks featured in the chart below, then thorough reviews of each. Alright, so you saw the top 5 digital ph meters above, what do you think so far? Do you want to see the rest? ​The chart was done just to cut to the chase, with my most recommended ph meters stacked up from #1 to #5. As you continue reading, you are going to see a complete list of pH meter reviews with detailed overviews and pros/cons based on the personal research done for each. While they are all digital, they are NOT created equally. Each one can measure the pH acidity and alkalinity in different ways with varied degrees of accuracy. The more expensive ones tend to be more accurate and thorough in their process (as you'd expect). Remember that you get what you pay for. Spend an average of around $30-$60 USD and odds are the device will be more thorough than your typical $13-$20 USD digital ph pens. 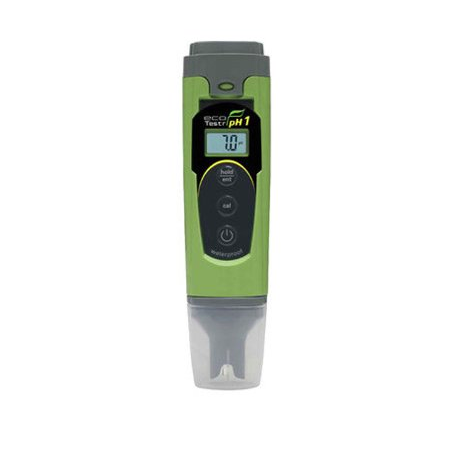 Coming in as #1 on my list is the Dr.Meter PH100-V pH meter. This one is here for ANYONE who wants high accuracy in measuring all types of liquid solutions. 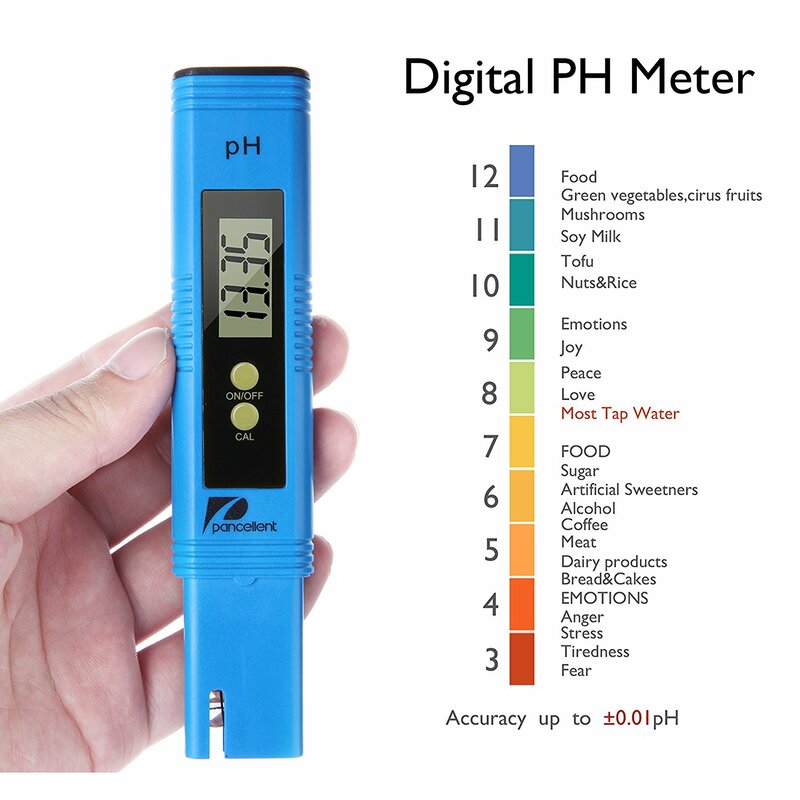 While it may not look attractive to the eye, I think its the best ph meter on this entire list for a few key reason (which I'll talk about shortly). This entire kit comes with exactly what you need to get things started. First you get a plastic case that lets you put the meter in and out, keeping it protected from the elements. In addition, there's a few packs of different solutions which help to neutralize the meter and give you the most accurate settings possible. Unlike many other pen styled meters, this one comes with an extra set of batteries. A total of EIGHT 1.5 volt button styled batteries to give you quite some time before needing to get new ones. This pH pen lets you see results through an LCD display (black and white), with pH ranging from 0-14 and ATS (automatic temperature compensation) for even more accurate results. For around $30 dollars, i'd say its at the PERFECT price point before you go into the more expensive units (with more bells and whistles). 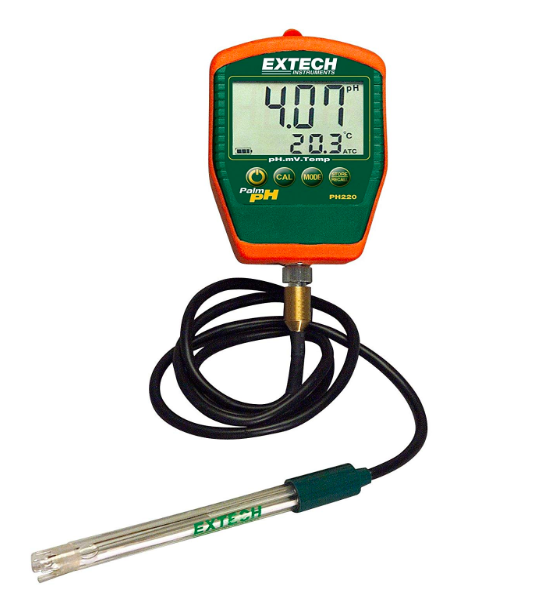 Compensates for different temperatures, more accurate reading. Includes solutions to create balanced readings. Replaceable batteries should give you at least one year of use. Improper calibration can lead to "off" readings. 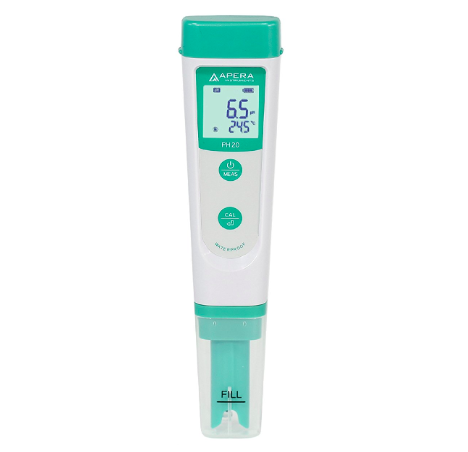 Coming in as our #2 pH tester is the Apera Instruments AI209 Ph20 pocket meter. I gotta be honest with you, if this one was priced less it would probably be rated as the #1. At around $50, its almost 2x the cost of what I mentioned above from the Dr.Meter. That I'd say is the only major downside with the meter. Why I picked this one is due to the amount of energy required to power it. Most meters take a few button sized batteries and that's it, not with this one though. While being a portable meter, it takes FOUR AAA batteries. How about 2000 hours of continuous operation, which in realistic terms if a few years of use under right conditions. You get a complete kit, from the meter, carrying strap, batteries, case, and balancing solutions. From the small lcd screen provided, there's all necessary information for measuring pH levels with with range from 0-14. A battery bar indicator shows you approximately how much use there's left until a replacement is due. Additional things about this meter is the ability to automatically recognize stable values, which improves consistency. Accuracy can be adjusted with the easy auto calibration options (using the solutions provided of course). Easy to read lcd screen. Up to 2000 hours of continuous use. Includes batteries to get started. Can auto-calibrate itself for quicker use. Kit comes complete with essential things to get started. Calibration can be tricky for first time use. 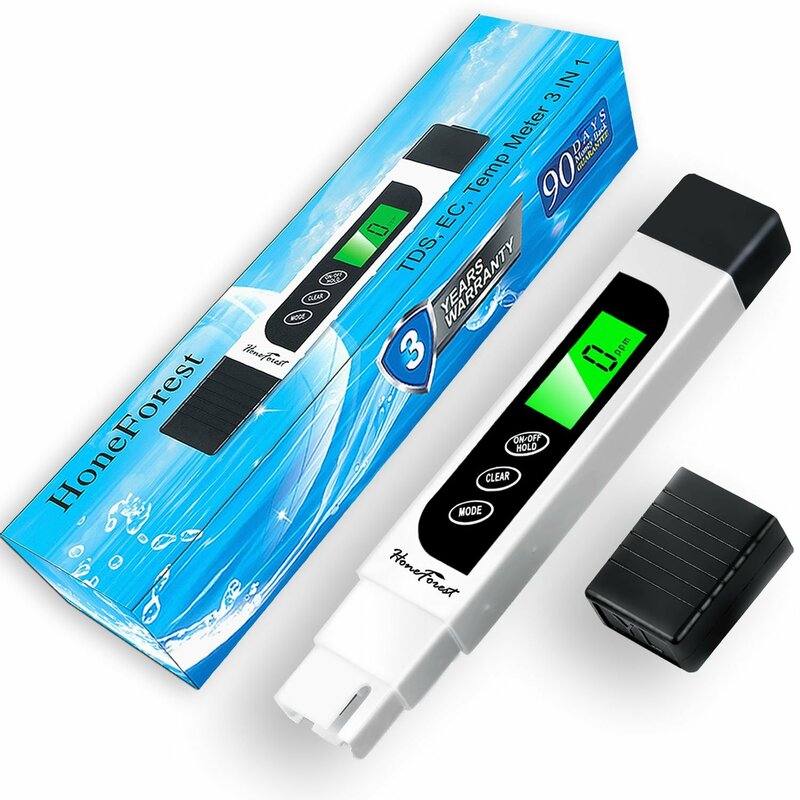 Next, the #3 most recommended digital pH pen is made by HoneForest. This one I had a lot of doubts about because, let's be honest... most especially on Amazon are copy and paste models of everything else. Just different colors, different brand names, and different features (or so it seems). While this one may not be the most expensive one on the list (not even close), it does serve a purpose when used properly. You see, $15 does not get you much. But what it does give you is the ability to measure TDS (total dissolved solids, EC (electrical conductivity), and water temperature. Alright so this one isn't a pH level measuring device, instead... it helps users know the purity of water before they drink it. Information you need to know when measuring water TDS is, when it's less than <40, the lcd screen will become green. When there's MORE than >40, the lcd screen will become red. Built-in software will automatically compensate for temperature differences, and auto lock and hold functions will lock the reading on request. If you want something ready to use OUT OF THE BOX, this one is automatically calibrated from the factory. It's quite good at measuring water impurities. Affordable way to measure water TDS. Easy to read LCD screen, with simple buttons that are singular in function. Want something VERY accurate in the way it measures the acidity and alkalinity of solutions? 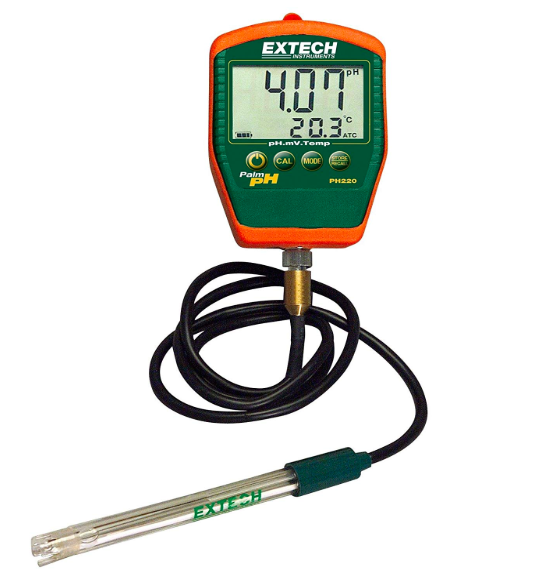 Well the #4 on this list is the Extech PH220-C handheld ph tester. This one looks quite different from the ones I mentioned above, it isn't necessarily small, its also not cheap. All the things that make this thing so great, is the technology that is inside. 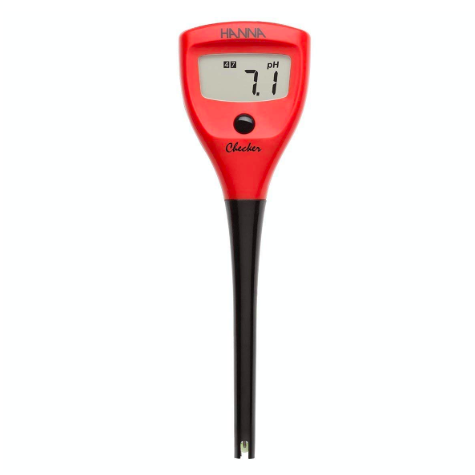 The entire thing fits in the palm of anyones hands, but how you measure the pH is with the probe which is attached to the palm meter using a waterproof cable. The electrode is around 12mm in diameter with 39" inches in cable length. You will be able to read EVERYTHING from the fairly large lcd screen. pH levels are measured with up to TWO decimals, so there's more accuracy as a whole. Also the ATC pH polycarbonate electrode can read the temperature of the solution you are putting the probe in. Unlike some cheaper units, this thing will automatically compensate for different temperatures. There's built-in memory that allows you to SAVE separate data points, making it great for type of areas that are not conductive to immediate analysis. My bottom line with this tester is this: for greater accuracy and for durability into the future, THIS thing is ideal. An extremely accurate way to measure pH levels of any liquid solution. This device allows you to save multiple data points. Compensates readings regardless of temperature (which it can also read). Past issue was the battery compartment popping out, but that may not be an issue nowadays. We are making some progress going down this list, here we have the #5 made by Oakton. Upon first looking at it, you may come to a quick conclusion of "being too expensive" and not enough pictures to justify what this product is all about. But let me tell you that spending the 70 dollars or so may be worthy after all. This is one of the few products where you get just one picture, but still happy users who buy it. I'm not sure how they get away with it, so that is up to them. 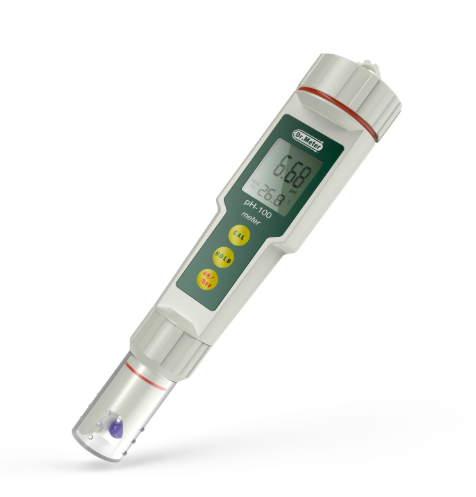 This is an electronic pH measuring device that much like others I talked about, lets you do things such as calibration, measuring the acidity and alkalinity in the full spectrum. While it does NOT come with any kind of standardized pH test solutions (requiring you to buy it separately), it DOES make it easy to calibrate for more accurate measurements. For the price, it may not be the best idea to get if you are taking into consideration the "temperature compensation" feature. Variable temperatures can make a difference in reading, unfortunately this thing does NOT have that built-in. Waterproof and dustproof hosting protects the fragile electrode. Measures acidity and alkalinity in full spectrum. Can hold a reading and auto-calibrate with an appropriate solution present. Does not auto compensate for temperature change. Price too high for what it features. 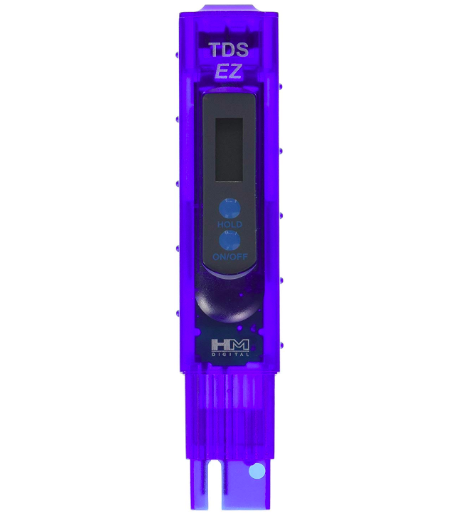 We are back to another TDS tester, this time it's made by HM Digital. Why in the world are we including these Total Dissolved Solids meters in our list when its all about ph testers? Well to be quite honest, its because there are FEW good ph testers on the market right now that are WITHIN reach of most people. The whole point of those devices to ensure the liquids are in a healthy state to where consuming it would be a good thing. Well when it comes to measuring dissolved solids, its a similar thing, except this time you are trying to measure the amount of solids (contaminants in the water, such as minerals and impurities). This one in particular is made to measuring from a range of 0 to 9999 ppm. For accuracy, the increments are in 1ppm from 0 to 999 and from 1000 to 9990 ppm the increments are by 10ppm. There's only two buttons being on/off and the HOLD button which will let you hold onto readings. For around 18 dollars, the device isn't a bad deal. You are getting a cheaper reader, so keep your expectations leveled for that price point. Cheap and affordable measuring device. Has small increments, which gives greater accuracy towards the exact number. Auto-off feature makes the device turn off after 10 minutes of no use. Does not come with calibration solution. There's a LONG probe, compared to most others that are short. I love it, especially for the unique design Hannah Instruments has taken. The long neck allows anyone to get into places that are rather narrow, or heck... even deeper without drowning the device. For the price it may be a bit expensive... but the unique design may be worth the money. The lcd screen is basic, showing you the current pH levels as you are measuring. While measuring, the unfortunate thing is that some have reported waiting a few minutes until the device settled on a pH level. I'll cover some of the pro's and con's so you can make a final call. My bottom line on this device is, it's an interesting design with some things left to be desired. You can try it and end up liking it, there's only one way to find out. Long neck lets you reach deeper places. Take a while at times to settle on a number. Coming in as LAST PLACE on this list is the Apera Instruments PH700 complete pH measuring kit. As you see above, Apera Instruments is making another appearance on this list but with a different type of product. If there was a MORE accurate way to measure water pH levels at home... this kit takes the cake, by far. While the most expensive unit on this list, it's that way for a reason. As you see, there's more moving parts to ensure you have a much more accurate reading. 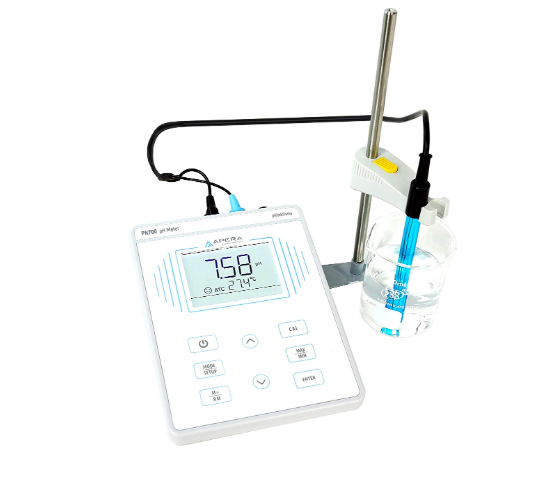 From the images, we see the actual reader which has an LCD screen showing you the pH level, temperature of the solution, power button, setup button, M+/RM button, calibrate button and min/maximum button. In addition to all those, you can use the up and down button to get between different menus. Just like the #5 I mentioned on this list, there's a probe which lets you put it anywhere you need to measure the acidity and alkalinity of things. When you get a : ) on the screen, it indicates you have steady readings (and you'll get a lot of those using THIS tool). Bottom online, for an expensive unit that IS worth the money, the PH700 by Apera Instruments is worth a look. An extremely accurate way to measure solutions. LCD screen is easy to navigate with plenty of options. The perfect long term tool for consistent use. Easy to stabilize on a reading. I hope you enjoyed reading this guide on the top 8 best ph meters to buy. As you saw, there's a list of cheap ones and a list of expensive ones. Depending on your needs, you'll have to go with one or the other. What it all comes down to is, how fast do you want your readings to appear and how accurate.